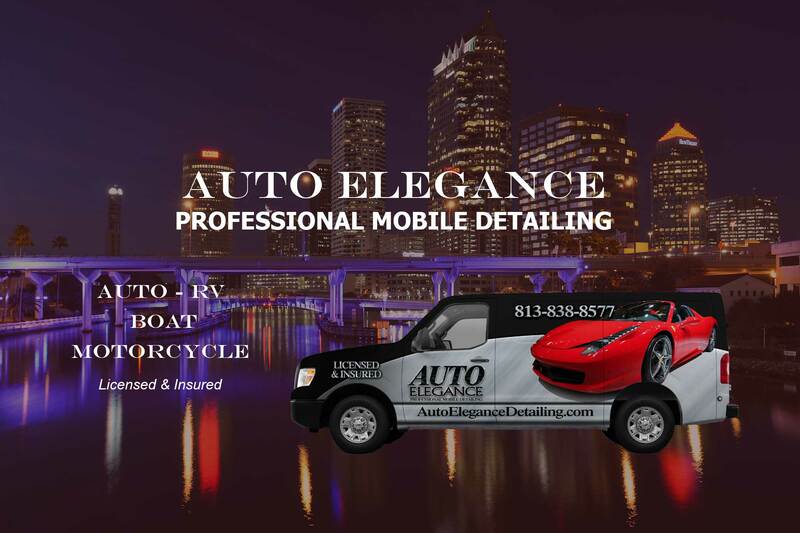 Since 2007 Auto Elegance Mobile Detailing has been servicing Tampa Bay and its surrounding areas with professional auto detailing. Auto Elegance is privately owned and operated offering multiple services to meet your vehicles needs. Auto Elegance Mobile Detailing uses the most modern cleaning equipment, uses the best products, and will come directly to you providing the finest quality service. Plus, Auto Elegance Detailing professionals supply all necessary equipment to detail your vehicle. Our self-contained mobile fleet is fully equipped with top of the line cleaning and detailing equipment. Our high quality services, reliable and courteous staff and convenience makes the value of Auto Elegance Detailing simply unmatched. At Auto Elegance Detailing, we know how important your car is to you and we take the hassle out of maintaining its appearance. Customer service and quality detailing are a priority. We take pride in all of our services and are happy to meet yours and your vehicles needs! We provide customers with a wide range of auto detailing services, for individual services and pricing contact us today!